As per analysis by Transparency Market Research (TMR) the global fortified rice market has an intense competitive vendor landscape. Key players such as Cargill Incorporated, Bunge Limited, Bühler AG, General Mills, Inc., BASF SE, and Wilmar International Ltd are operating in the global fortified rice market. In order to survive in the competition, the players are entering in to mergers and acquisitions for widening their product portfolio. Thanks to these strategies, the market is witnessing increased level of competition in the fortified rice market. According to the report by Transparency Market Research, the fortified rice market is projected to reach a value of US$25,000 mn by 2026-end. 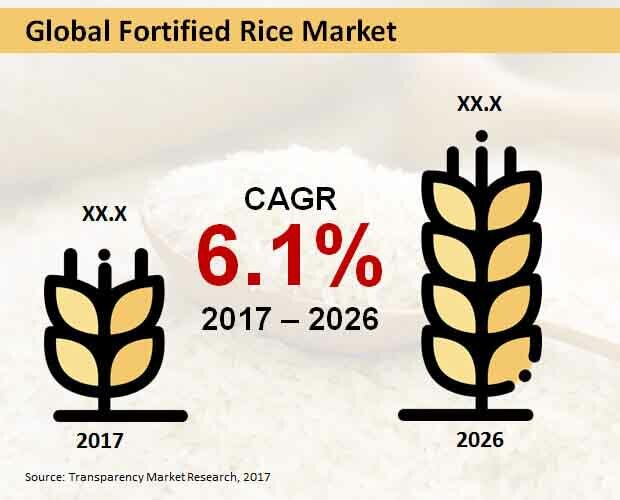 Based on the technology, the coating & encapsulation segment dominated the global fortified rice market and is expected to remain dominant over the forecast period. Based on the region, the Asia Pacific dominated the global fortified rice market and is expected to remain dominant over the forecast period. This growth is attributable to the presence of the agriculture-based countries such as India and China, which is leading to boost the fortified rice production. Outstanding advancement happening in sustenance innovations, particularly as far as advancement of fortified rice benefits, is in charge of driving the global fortified rice market. In addition, a rising interest for fortified rice as a key wellspring of vitality and supplements also has made the market increase quick-paced development. Formulas that make utilization of fortified rice are generally being seen everywhere throughout the world. Additionally, significance connected to utilization of fortified rice-rich nourishments likewise has ended up being useful to the global fortified rice market. Besides, a rising tendency of purchasers for fortified rice is relied upon to make the market observer taking off development sooner rather than later. In conclusion, new creation strategies and trial preliminaries are being directed to upgrade the generation of fortified rice for vast scale generation, subsequently extending the global fortified rice market. However, preparing fortified rice items isn't yet accessible on an extensive scale premise in many immature and rising economies. This factor is incredibly ruining the fortified rice market, particularly from a provincial point of view. Additionally, staggering expenses required to set up plants that oversee everything extending from isolating crude rice material to thinking of the last item considered safe for selling, could end up being costly for the end clients. This is outstandingly preventing the worldwide fortified rice market as well. By the by, numerous organizations are relied upon to present savvy arrangements in future, which could lessen impacts of the limitations following up on this market.